THE STORY - Despite his family's generations-old ban on music, young Miguel dreams of becoming an accomplished musician like his idol Ernesto de la Cruz. Desperate to prove his talent, Miguel finds himself in the stunning and colorful Land of the Dead. After meeting a charming trickster named Hector, the two new friends embark on an extraordinary journey to unlock the real story behind Miguel's family history. THE GOOD - Solid balance between adult themes and a child-like sense of wonder and fun. A heartwarming story that focuses on a culture that does not get enough exposure from American audiences. THE BAD - Music may unite us but why is the music so unmemorable then? A slightly missed opportunity to explore deeper and more complex themes. Not the funniest or most visually breathtaking animated film you'll ever see. ​Maybe it's because we were so spoiled by that glorious run from 2007-2010 where Pixar released 4-Academy Award-winning masterpieces in a row ("Ratatouille," "WALL-E," "UP" & "Toy Story 3") that we hold them to such a high standard. The come-down period came afterward with "Cars 2," "Brave" & "Monsters University." The studio found its footing again with "Inside Out" which united critics and audiences once again in unanimous praise. And now, after the most disappointing run of all with "The Good Dinosaur," "Finding Dory" and "Cars 3" we finally arrive at "Coco." Lee Unkrich's film (Director of "Toy Story 3") gives the animation titan their mojo back with a musically charged story that presents a unique vision, mature themes and fun for the whole family. "Coco," tells the story of Miguel Rivera (Anthony Gonzalez), a 12-year old aspiring musician whose family has outlawed music for generations after Miguel's great-grandfather (A musician) abandoned his family to pursue his career and ambition. When the family finds out that Miguel wishes to play music instead of becoming a shoemaker along with the rest of the family in Mexico, they upset him and thus, Miguel flees on Dia de Muertos (Day Of The Dead). When trying to take the legendary relic guitar of the long-gone famous musician Ernesto de la Cruz (Benjamin Bratt), Miguel finds himself trapped in the land of the dead. Only with a family member's blessing can he go back to the land of the living. However, if he cannot get their blessing by the time Dia de Muertos ends, he will be stuck there forever, or at least by the laws of this movie, until everyone on earth forgets him and then he'll fade into nothing or as it's called in the film, "the final death." One such character named Hector (Gael García Bernal), a charming trickster who is in danger of being forgotten, partners up with Miguel to help him find a family member who will give Miguel their blessing, Miguel, in turn, promises to make sure that Hector's photo is hung up by his family, so that Hector can pass through unseen to the land of the living and see his daughter one more time before he fades from her memory. As far as animation goes, "Coco" is not the most visually dazzling animated film you will see all year. That title still belongs to "Loving Vincent." However, "Coco" might have the most heart of any animated film you see all year. Striking that wonderful balance that Pixar is known for between childish comedic elements (Cooky undead sidekick dog? Check. Comically animated undead characters that look more friendly than those found in "Corpse Bride?" Check) and the more adult-friendly dramatic elements (Themes revolving around life and death and a unique vision of the afterlife that will invoke memories of "What Dreams May Come" but for kids), "Coco" has something for everyone. With earnest characters that have simple motivations which we can relate to and a story that is timeless in how it utilizes music to unite us through anger, indifference, time and death, "Coco" very nearly approaches those Pixar films from the 2007-2010 era. The only drawbacks I can see with "Coco" are ironically within the storytelling itself. I know. After I just praised its storytelling, how can that also be a detriment? "Coco" may be the best-animated film of the year in terms of mixing those dramatic and kid-friendly elements. But as I said before, it is not the most visually dazzling nor is it the most humorous ("The Lego Batman Movie" still takes the prize on that one). "Coco" may not do one of these things better than the other mentioned films but in terms of putting those elements together, it's the overall package that counts. "Coco" doesn't take risks with its characters or its setting, other than having the most occasional use of the word "murder" I can remember coming from a children's film. It almost feels like a missed opportunity at times to go deeper into this culture's lifestyle, hardships and explore its themes deeper. One such example revolves around how hanging up the pictures of the deceased in the land of the living allows for their memory to live on, thus giving them access to visit the land of the living once a year on the Day Of The Dead. The film treats this process almost like immigrating from America to Mexico or vice versa. More explorations of the Mexican experience instead of manufactured universal storytelling tropes is what I wanted more of from "Coco." Instead, we get a few third act twists we can see coming a mile away and a story that plays out exactly how you would expect by the time we get to act two. This is not to say "Coco" is bad. It just has a high standard to live up to based on the films which have come from the studio before and doesn't do quite enough to set itself apart to make it a truly unique experience which would catapult it to current level masterpiece status. 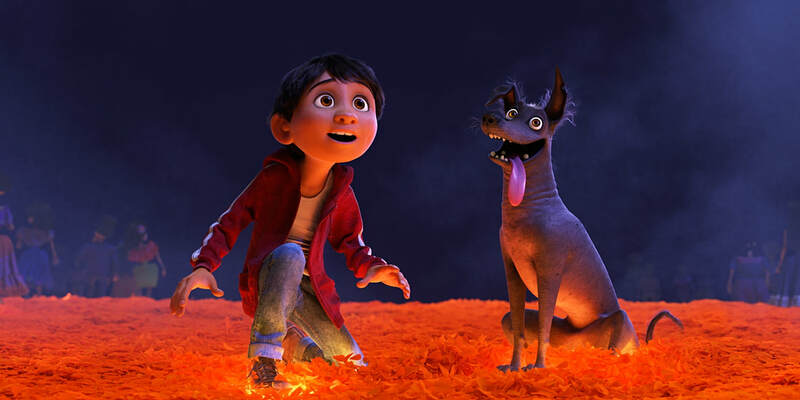 A beautiful story about "seizing your moment," embracing your creativity and never forgetting your familial roots, "Coco" is easily digestible for children while giving adults enough to chew on as well at the multiplex. It's a joyous family film that managed to bring some tears to eyes in my screening and near unanimous applause from its audience as the credits rolled. A definite crowdpleaser that, while not quite a new classic from Pixar in my own eyes, it will not soon be forgotten and will more than likely rise up the ranks as the years go on and I continually revisit it. "Coco" demands that you remember it. You may not remember its characters. You may not remember its songs. You may not remember everything. Buy you will remember how it made you feel.